Inspired by her affection for the French novelist Marcel Proust, Kate’s prize-winning debut novel weaves together the stories of three women that span the 20th century. One is a diary written by Proust’s mother in turn-of-the-century Paris; another is the story of Sarah Bensimon, a Jewish refugee who immigrates from France to Canada during the Second World War and the third is that of Marie Prevost, a contemporary Montrealer and translator who ties these strands together. 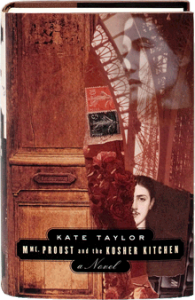 Madame Proust and the Kosher Kitchen won The Commonwealth Prize for Best First Book (Canada/Caribbean region), the Toronto Book Award and the Canadian Jewish Book Award for fiction in 2004. Here are some additional reviews of Mme Proust. For more information, a reader’s guide (http://www NULL.bookclubs NULL.ca/catalog/display NULL.pperl?isbn=9780385658355&view=rg) is also available.